We have and RDS cluster everythings is working fine. We use roaming profiles, redirection to a share is working as well. When a user logs on to any RDS node we can see a user folder appear in E:\Users\ of the RDS Server. E:\Users\<username> is the local cache of the roaming profile. I’ve never seen a setting to avoid caching of the profile on the local system entirely. 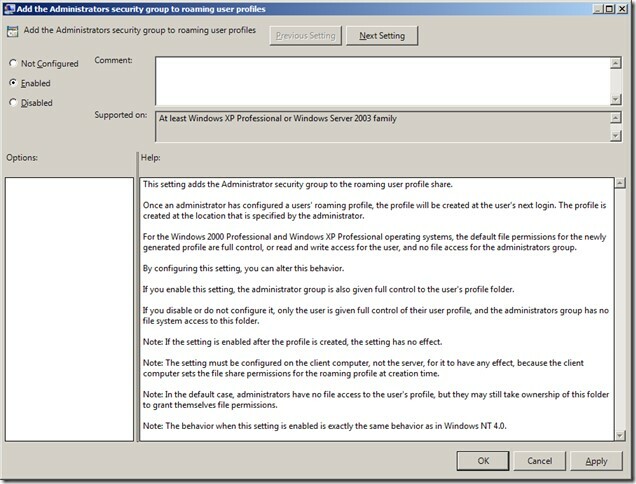 There is a group policy setting to automatically delete the cached copy upon user logout. It’s under Computer Configuation->Policies->Administrative Templates->System->UserProfiles->Delete cached copies of roaming profiles. It will probably increase the logon time as the full profile will have to copy every time. When testing, this also cleared out the cache from a custom application which didnt right back to the roaming profile. Some of our users keep getting logged on with a temporary profile. We have an RDS cluster using Window 2008 R2 x64 and users are setup with roaming profiles. Profiles going to \\server\users\%username% Intermittently the folder is being created in the profile share but the folder is empty. Possibly caused by a server crash corrupting the profiles instead of a natural logoff allowing the profile to write back.